The six Herdman children are “absolutely the worst kids in the history of the world.” They lie and steal and smoke cigars. They even burned down Fred Shoemaker’s old toolhouse. Now they’re taking over the Christmas pageant. The Herdmans have never heard the Christmas story before, and they don’t know anything about shepherds or Wise Men. When Imogene hears about the swaddling clothes, she demands to know why anyone would tie up a baby and put him in a feedbox. Leroy, Claude, and Ollie are planning on a gift that means much more than gold, frankincense, and myrrh—the ham from their Christmas basket. 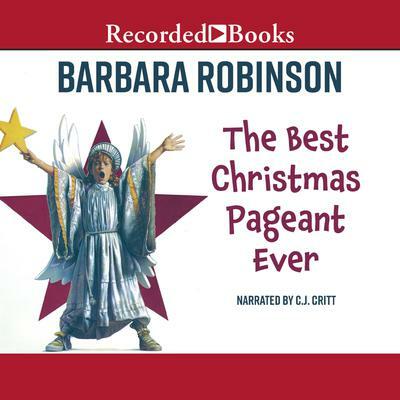 The Best Christmas Pageant Ever, now also a television movie, has been a favorite of children and their parents since 1972. As C.J. Critt’s spirited narration captures the lively and outrageous spin that the Herdmans put on the Nativity scene, listeners will delight in this unusual and refreshing interpretation of Christmas.